A bucket list item for many ultrarunners. The JFK 50 Mile Memorial Run is an ultramarathon that has been taking place annually since 1963 in Washington County, Maryland. 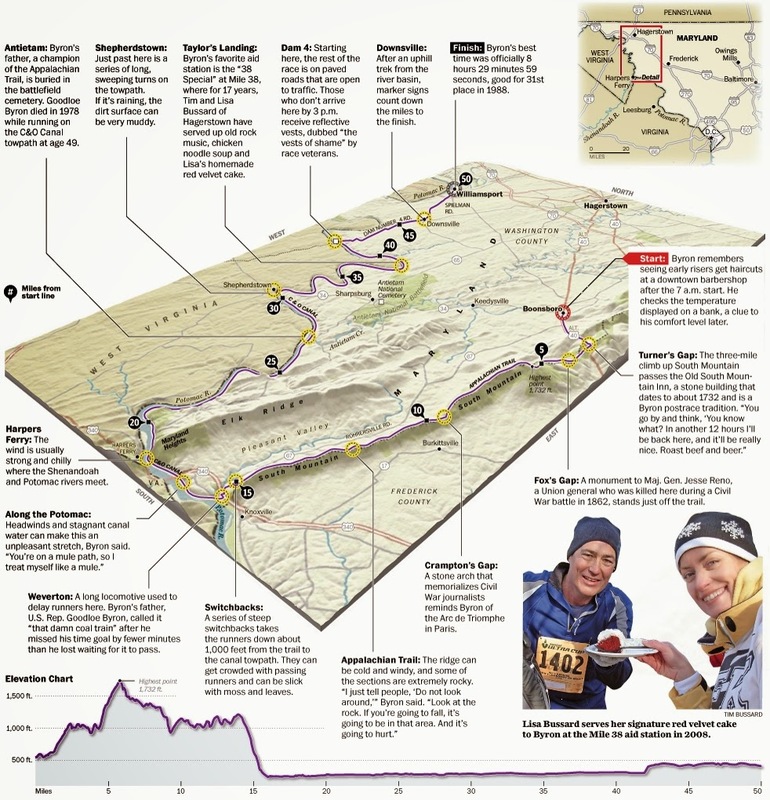 It is the largest and oldest running ultramarathon in the United States that start in the town of Boonsboro, Maryland and leads 2.3 miles on asphalt roads towards South Mountain before entering the Appalachian Trail for 13 miles. The course then continues on the Chesapeake and Ohio Canal towpath and along the Potomac river for 26.3 miles before entering the final 8.4 mile leg of the race along rolling country roads. The race finishes in Williamsport, Maryland right in front of Springfield Middle School. The course is laid out in a point-to-point configuration that resembles a horseshoe and covers a total of 50.2 miles with +3,300ft elevation gain (according to my Garmin Fenix altimeter). This rather varied race course with its rugged Appalachian Trail section, smooth gravel and dirt towpath and rolling country roads is not only challenging to both seasoned ultrarunners and newbies alike, it is also extremely beautiful. This past weekend, I had the unexpected opportunity to run this race for the first time. In fact, the subject of this race didn't even come up until just two and a half weeks ago during an easy recovery run. Dink Taylor, a friend and seasoned ultrarunner, had been running this race regularly for the past few years and he was headed that way again this year. This race truly is the granddaddy of all ultramarathons in the US, so when he offered to join him, I booked a cheap flight from Huntsville to DC and gladly accepted the offer. After we both arrived in DC on different flights a couple of hours apart, we took the rental car shuttle and picked up the car Dink had reserved before driving 80 minutes to our hotel in Hagerstown, where we would check in and meet up with friends of Dink's before we all headed to packet pickup and dinner. On that note, a heartfelt thanks goes out to Luke, Thom, Vic, Dave and Tara for making me feel so welcome during this trip. I had a blast hanging out with you guys before, during and after the race and hopefully, I will be able to do so again next year. After dropping off two of our cars at the finish line, we all headed to the race hotel for packet pickup. While there, I also got the opportunity, thanks to Luke and Dink, to meet Mike Spinnler, the RD of the JFK 50 Miler. Not only does this guy have a great sense of humor, he also appreciates "real" football;-) After packet pickup, it was time for a quick dinner before we all headed back to the hotel. With the race not starting until 7AM, we got to sleep in until about 5AM with enough time for breakfast and any other important pre-race activities. At 6AM, we all met up in the lobby to head to the race start. Once more, it paid off to be hanging out with folks that had done this race in the past as we literally were able to park "on" the starting line. With temperatures hovering at 17 degree when we left the hotel, this was definitely much appreciated as we were able to stay in the comfort of a warm car until 5 minutes before race start. I hadn't expected temps to be quite so low, so I decided to keep a long sleeve t-shirt over my racing singlet and compression sleeves until we hit the towpath. I figured temps will have risen enough by then to drop the additional layer. Dink didn't really have a race goal other than sub 8 hour or maybe 7:40 and since I wanted to try for a sub 7:30, I figured it would be a good idea to just stick with Dink as long as I could. IF I felt good, I could always try to run faster later on. Ha, yeah right, like that ever works, running faster at the end of an ultra. Anyway, my initial "strategy was sub 10 min pace for the first 15.5 miles on the AT and then hopefully drop to am 8:30 min per mile pace for the "final" 34.5 miles on the 26.3 mile towpath and 8.4 mile country road stretch. Just as soon as the throng of 1000 runners arrived from their 1 mile walk from the parking lot, the race got underway at 7AM sharp. We ran down the street headed straight for a winding road leading up to South Mountain and the AT. After about 2.5 miles of climbing we got our first taste of the AT before getting on a paved access road again to continue our climb up to "the tower". Once we arrived at the top, we finally entered the AT for good. The most important part of this section of the race would be the footing. Too many runners threw caution to the wind to try to race this section and too many runners pay the price by either tripping on leave covered rocks of the AT or by fizzling out too early in the race, only to be reduced to a death march to the finish. Joe took off and I wouldn't see him again until later in the race. Dink and I kept a comfortable pace and before we knew it, we were dropping down about 1000ft over a short 1 mile stretch of switchbacks before we hit the Weverton aid station at mile 15.5. This indicated the start of the 26.3 mile tow path section. I dropped my extra layer, refueled and moved on. We settled for an 8:20 min pace pretty quickly and it seemed Dink was slightly more comfortable at this pace then I was. Running this pace felt harder to me than it should. I decided to hold it for as long as I could and then reevaluate. It seemed I had not fully recovered from my 100 miler 3 weeks earlier. I knew that could be a possibility, so I wasn't too distraught. The next few miles were uneventful as we ticked off the miles at a steady pace, but I could tell Dink was feeling pretty food while I was starting to just hang on. By mile 23, Dink decided to drop the pace and I decided right away to just hang on to my 8:20-8:30 min miles. He was out of my line of sight within 3-4 miles. By that time, I caught up to Joe and we started running together. Turns out, this guy was actually doing his first 50 mile race. I figured I'd try to run with him as long as I could. I fully expected the wheels to come off at some point as I felt I was working way too hard for my current pace. At mile 35, my pace started to drop rapidly. I was now hanging on to sub 9 min pace for dear life. Throw in a couple of longer than expected aid station stops and my sub 7:30 finish quickly disappeared. Joe and I continued to run together and that helped me tremendously he helped me not fall off pace even more than I did. He kept me going when all I wanted to do is slow down and walk. A not so quick look at my watch told me that we needed to hold sub 10 min pace, if we wanted to squeeze in under 8 hours. Ugh, so much for 7:30, oh well. We knew that the course would be marked with mile markers from here on out, counting down from 8 miles, 7 miles, 6 miles, and so on, all the way to the finish. Every time we encountered a mile marker, we redid our math and every time, we had gained a minute or two against the clock. With about a mile to go, we realized that a strong finish would have us cross the finish line in under 7:50 hours, so we pushed. Joe and I finished 64th and 65th out of 1000 starters, respectively and Chad finished just behind us. I can honestly say, this one was definitely tougher and hurt more than I expected and finally receiving the finisher's medal felt great! Dink had been hanging out inside the warm gym for some post race refreshments. He finished well ahead of us, which I had expected and if I did my math correctly, Dink, Chad and I ended up fifth overall in the team competition. We celebrated our finishes with a nice steak dinner and a couple of well deserved refreshments before returning to Huntsville the next day. Finally, I'd like to thank race director Mike Spinnler and his wife along with his amazing team of volunteers, who made this truly one of the best ultramarathon experiences I've ever had. It did not take 5 minutes after the race for me to decide to come back for more, even though I questioned my running more than once in the later stages of this race:-) I also made a lot of new friends this weekend and that is worth even more to me than crossing the finish line of any race. Great race, great people, what else could one ask for. Great course description courtesy of the Washington Post.